Goat’s Rue is a perennial which grows rapidly in urban environments. 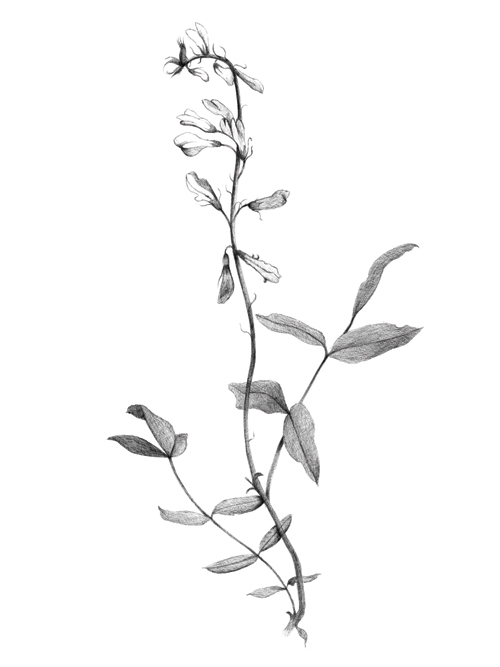 The plant can reach up to 1.2 metres in height. It has many branching stems, with clusters of white or purplish flowers arranged along the main branch of the plant. Goat’s Rue is native to the Middle East and has been successfully cultivated in Europe since the Middle Ages. The species has adapted well to the urban environment and can be found growing in parks, gardens, along footpaths and roads. Aerial parts of the plant were used medicinally in medieval Europe to treat plague, worms, snake bites, miasma and dysuria. The plant was also fed to livestock to increase milk yield. Witters LA. 2001 The blooming of the French lilac J. Clin. Invest. 108: 1105-1107. Petricic J, Kalodera Z. Galegin in the goat's rue herb: its toxicity, antidiabetic activity and content determination. Acta Pharm Jugosl . 1982;32:219-223. Bisset N, ed. Herbal Drugs and Phytopharmaceuticals . Stuttgart, Germany: CRC Press. 1994;220-221. Atanasov AT., Spasov V. 2000 Inhibiting and disaggregating effect of gel-filtered Galega officinalis L. herbal extract on platelet aggregation. Journal of Ethnopharmacology 69: 231-240. Stosic D, Bogavac P, Panov I. Medicinal plant raw materials with antihyperglycemic activity. Arh Farm . 1993;43:35-41. PALIT P., FURMAN BL., GRAY AI. 1999 Novel weight-reducing activity of Galega officinalis in Mice J. Pharmacology and pharmacology 51: 1313-1319. Turkyilmaz C, Onal E, Hirfanoglu IM et al. The effect of galactagogue herbal tea on breast milk production and short-term catch-up of birth weight in the first week of life. J Altern Complement Med. 2011;17:139-42.